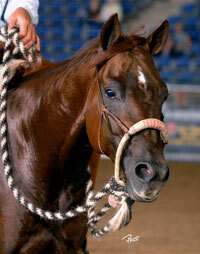 Blue's training approach with horses, young or older, stresses a soft hand to achieve a soft, yielding horse. "If you don't have his face, you don't have the horse's body in the right position to perform all the maneuvers a cow horse needs to perform," he says. Which is not to say that a firm hand and a well-placed spur aren't part of the training program. Still the program is not the same for every horse. Although all trainers have a particular style and approach to a horse, Blue works to keep an open mind so he can adapt his techniques and skills to the particular needs of each horse. "There's nothing worse than to push a young horse too hard too soon," Blue says. 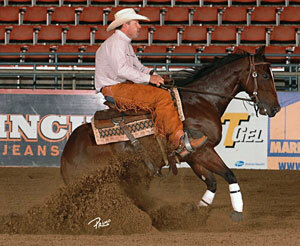 "He may make it through Futurity, but then things start to fall apart." For riders, Blue sets high expectations meant to turn "would-bes" into "winners" in the show arena. Whether you're a novice, non-pro or youth, you'll experience the same standard of training from Blue. Blue expresses pride in his many clients who are consistent money-earners and others who have made the transition from "unable" to "very capable."